$200 off Rinnai tankless water heater installation by Clovis Plumbing Services! Offer applies to the purchase and installation of a Rinnai water heater. Get continuous hot water supply from the most prominent name in tankless water heaters. 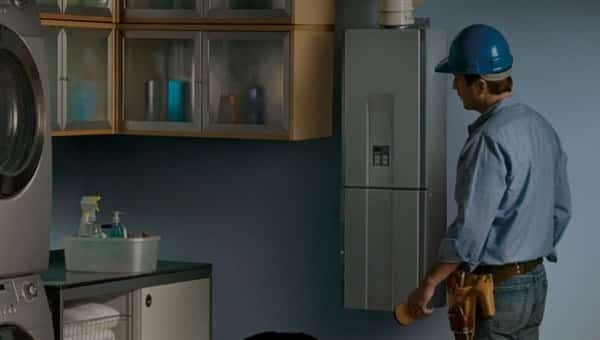 Whether installed inside or outside your home, there's a Rinnai tankless unit that can meet your needs. Property owners are opting for tankless water heaters include continuous hot water, extra space for storage and lesser energy bills. However, many people don’t consider these perks huge enough to make up for the extra cost of purchase and installation. According to estimates by the U.S. Department of Energy, gas-powered tankless heaters save about $108 in energy costs yearly. Sounds like a good deal right? Just hold off on squandering that savings yet. It costs about three times extra to purchase a tankless water heater than the regular tank type water heater. In addition, it is not every home that is prepared to accommodate a tankless water heater. When shopping for a tankless unit, you must first consider the water demands of your household. Add up the maximum number of fixtures that you will run at the same time and their total flow of water. Then, add up the demand for water in gallons per minute you’ll want from the water heater. For example, let’s say you expect to run the dishwasher, the clothes washer and take a shower at the same time. The flow rate through the Rinnai water heater would need to be at least 5.5 gallons per minute. That can easily be accomplished with the smallest unit, the Rinnai RU160. Warranty: Knowing the length of your tankless water heater warranty is a primary concern. Energy conservation: Energy savings is the main reason to make a switch to this new technology. Durability: No one wants to buy a water heater today and then replace it tomorrow. Hot water flow rate: Select a model that will provide high flow rates when running multiple fixtures. Price: Pricing should always be a priority but not the main purchasing factor. The price of purchasing and installing a tankless system is much higher than the cost of a traditional tank. Tankless water heaters will be more beneficial and cost-effective to families who use a lot of water. It requires the services of an expert plumber at least yearly to descale tankless heaters. As a homeowner, it will cost you 4 to 5 thousands dollars in order to accommodate the tankless system. What is the future of traditional heaters? Tod Dale of Clovis Plumbing Services in Clovis, California, as well as many water heating experts, are of the opinion that the Rinnai tankless water heater installation is the future of water heating. We expect an improvement on the technology behind the product and newly constructed buildings ought to adjust speedily to the additional tankless requirements. "Almost everyone wins in this situation," he says. "But at this instant, just not everybody."